Today QASymphony released an integration with Tricentis Flood, an intelligent load testing tool for DevOps. Performance testing is one of the most frequently requested tool integrations we receive for qTest, so we’re excited to offer our customers direct access, through the qTest interface, to run and view load test results in Flood. Watch the video below to see how to get started with 20 free node hours of load testing with Flood. 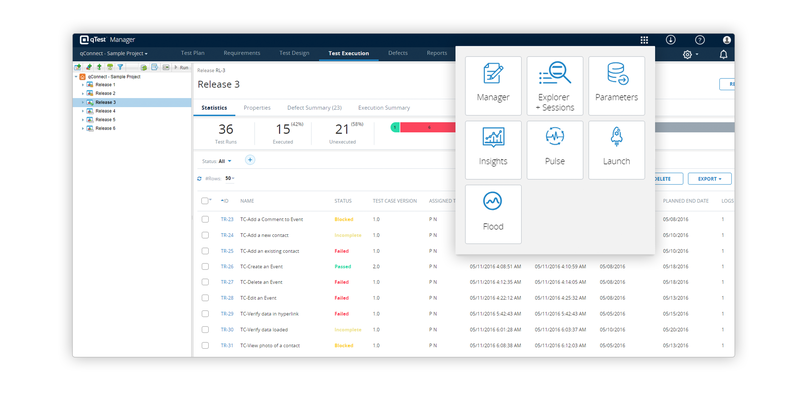 Flood is a cloud-based, distributed load testing solution that helps teams test how their applications scale with massive load generated from around the world. Flood can generate load using popular open source load testing tools (such as Apache JMeter, Gatling and Chrome) as well as Tricentis Tosca functional testing cases (API and UI). How Does Flood Integrate with qTest? The current integration includes synchronization of qTest users and projects to Flood for easy organization. We’re also offering all qTest customers 20 node hours of free performance testing. That’s enough to run a variety of tests, including a 100,000 user JMeter test for 12 minutes. For future integrations, we plan on combining reporting in Flood with qTest Insights for a holistic view of testing progress. Starting today, you can access Tricentis Flood through the 9-Box in qTest. Simply click the Flood icon, and you will be transferred to Flood, where your qTest users and projects have been synchronized. Once you get into Flood you will have multiple options to start creating load and performance tests. Write your first load test using our web based editor in our test builder. This is great for simple tests where JMeter is too complicated. Experiment with Flood Element, a tool that can allow you to do performance testing through the browser with increased efficiency. Upload JMeter, Gatling or Selenium tests that you have already written via our test script upload functionality. What Can I Do With Flood? Flood allows you to run tests with as few as 10 to as many as 10 million users, with the ability to generate load from across the world in just minutes. Flood’s flexible architecture allows you to run tests in a shared cloud as well as within your own AWS account. After each execution, Flood will then aggregate the results from any framework into one consistent, readable report format that quickly highlights performance bottlenecks. Flood has many flexible plans depending on the hosting you’d like to use as well as the number of resources (servers) you will need to run your tests. You can see pricing publicly at flood.io/pricing.